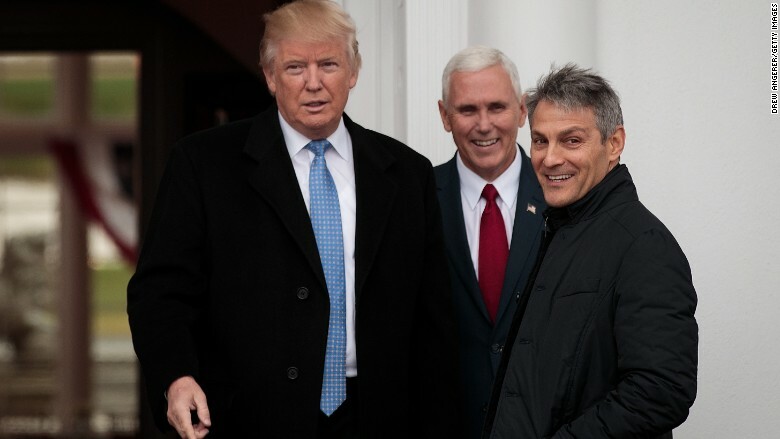 President-elect Donald Trump, Vice President-elect Mike Pence and Ari Emanuel before their meeting at Trump's golf course in New Jersey on Sunday. In between his meetings with prospective cabinet members, President-elect Donald Trump took time to confer with his former Hollywood agent, Ari Emanuel. A spokesman for Emanuel said Sunday's visit was not about a job. "He is not seeking a role in administration," the spokesman said. But Emanuel is a longtime friend of Trump's. He is also a longtime Democratic fund-raiser. He is not commenting on the substance of the meeting. When Emanuel arrived for the meeting at Trump's Bedminster, New Jersey golf course around noon on Sunday, Trump called him "the king of Hollywood." Then the two men headed inside. A person with knowledge of the meeting said Emanuel sought to "discuss some concerns he had." The source would not elaborate on the type of concerns. When the two men walked outside afterward, Trump called Emanuel a "great friend." Emanuel, one of the most powerful figures in the entertainment industry, is the co-CEO of WME/IMG, a sprawling Hollywood talent agency. The firm was recently valued at $5.5 billion. Trump was one of his many clients over the years. Emanuel represented Trump in some of the negotiations with NBC over "The Celebrity Apprentice." And in summer 2015, when Trump needed to unload his ownership stake in the Miss Universe Organization, he sold it to WME-IMG. The purchase price was not disclosed. WME/IMG said it no longer represents Trump. Emanuel is part of a famous family. One of Emanuel's brothers, Rahm Emanuel, is the mayor of Chicago and a former chief of staff to President Obama. His other brother, Ezekiel, helped shape the Obama administration's Affordable Care Act.